On a visit to the estate of her friend, the young and beautiful Isobel Payne, Countess of Scargrave, Jane bears witness to a tragedy. Isobel's husband—a gentleman of mature years—is felled by a mysterious and agonizing ailment. The Earl's death seems a cruel blow of fate for the newly married Isobel. Yet the bereaved widow soon finds that it's only the beginning of her misfortune...as she receives a sinister missive accusing her and the Earl's nephew of adultery—and murder. 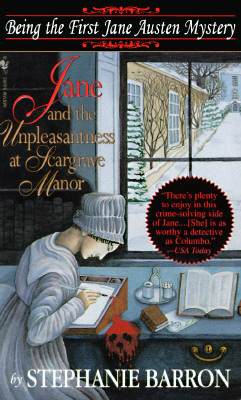 Desperately afraid that the letter will expose her to the worst sort of scandal, Isobel begs Jane for help. And Jane finds herself embroiled in a perilous investigation that will soon have her following a trail of clues that leads all the way to Newgate Prison and the House of Lords—a trail that may well place Jane's own person in the gravest jeopardy.